The United States Fencing Coaches Association Center of Excellence program recognizes fencing clubs, salles, and programs that meet a gold standard among places to learn to fence and to train for competition, that offer a full range of services to their members, and that commit and to a program of continual improvement in the services they offer. Centers of Excellence have internationally recognized, certified, professional coaching staffs led by a Moniteur, Prevot, or Maitre. Salle Green’s coaching staff includes Maitre d’Armes Walter Green, Prevot d’Epee Mark Logan, and Assistant Moniteurs Fred Vegas, David Dimmett, Alex Stubblefield, and Evan Zook. Coaches must commit to ethical coaching, adhere to US Olympic Committee’s Coaching Code of Conduct, and be Professional Members of USA Fencing with current Safe Sport athlete protection training. Coaches and clubs commit to regular continuing education to ensure that their methods of training are up-to-date. Salle Green coaching staff attend clinics and the annua Coaching Conference of the United States Fencing Coaches Association. In addition, the Salle has a monthly coaching continuing education program, with presentations on a variety of topics, and distributes a wide variety of coaching articles on a weekly basis to its staff . 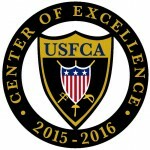 Centers of Excellence are required have in-place procedures and the administrative structure needed to provide excellence services to their athletes, ranging from emergency plans to policies for fencer and staff conduct and equipment maintenance. There must be a regular method of communication with the membership, which Salle Green does through its social media pages and its monthly newsletter Thrust and Cut. Finally, a Center of Excellence must have the facilities and equipment needed to train athletes, supporting a range of fencing and physical conditioning activities. The Center of Excellence designation must be renewed every year. Salle Green has earned the Center of Excellence designation in the 2013-2014, 2014-2015, and 2015-2016 fencing seasons. The Center of Excellence program was established in August 2013. In prior years the United States Fencing Coaches association offered a similar recognition of excellence, the Guild Academy designation. The Salle held the Guild Academy designation from its inception in 2007 to 2013.